Is anyone else counting down to Christmas? Ok, so I'm not really counting down yet, but I am starting to think about things that need to be done for Christmas (cards, gifts, etc.). I needed to get a few cards ready for a swap, so I decided to use the Trim the Tree DSP Stack as a backdrop for a Christmas thank you card. There are still quite a few days until Christmas, but I hope to have everything ready well before then. These simple thank yous are a great start! Have a great holiday weekend! I'll be back on Tuesday with the Weekly Deals! The Holiday Catalog is Live Today! And An Exciting New Benefit for My Customers! Have you seen this little beauty yet? 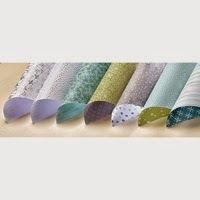 The All is Calm product suite is just beautiful, and I especially love the All is Calm Designer Series Paper! Gorgeous color combinations and patterns - I can't wait to use more of it! The Festival of Trees Bundle is awesome! It's photopolymer, which makes stamping super-easy, and who doesn't love a coordinating punch? This set is great for Christmas cards! 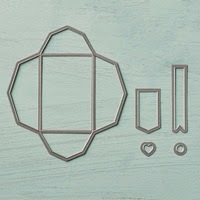 The Gift Card Envelope & Trims Thinlits Dies make it so easy to create cute packaging for gift cards. This is on the top of my (very long!) wish list! Finally, the stamp set For All Things. I love the watercolor look of the images, and I can't wait to show you some beautiful cards made with this set! I could keep on going (I really do love almost everything in the Holiday Catalog! ), but I'll let you take a look for yourself. I'd love to know what your favorites are! One last thing to share today: I am starting a new program for my customers, the 50/50 Board. Maybe some of you have heard of this before. Here's how it works: for every $50 you spend (in one order), I will put your name in one of the squares on my 50/50 board. Once the board is filled up, I will randomly pick one square as the winner, and that person will win a $50 shopping spree! You cannot combine orders to get to the $50, but if you spend more than $50 in one order, you have the opportunity to get your name on more squares. For example, if you place two $25 orders, you do not get a square on the board. But if you place a $100 order, you would get two squares on the board. Make sense? Now is a great time to place an order and earn your first square on the board. 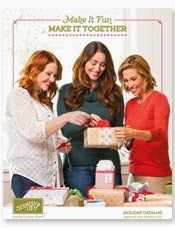 So many great things to choose from in the new Holiday Catalog! Have fun shopping! *I didn't think my nephew would appreciate the Strawberry Slush border on the banner, so I flipped it over and used a sponge dauber to add a little bit of Mossy Meadow to the edge. *I cut the smaller striped card in half (this way I can use the other half later!). 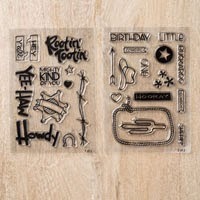 *I thought the new Lucky Stars embossing folder (available tomorrow!) was a perfect background to match the star behind the greeting. So there you go. Just a few extra items, and you have another use for your Paper Pumpkin kit. If you love the look of the embossed stars, make sure to order your Big Shot and get in on the great deal going on for only a few more days! It's not very often you get $60 worth of FREE items with your order! Check out the details of this deal here. My grandma's birthday was last week, and I needed an easy card (because I was late in sending it - oops!). My go-to for easy cards is Designer Series Paper, because it adds a lot of interest without a lot of work. 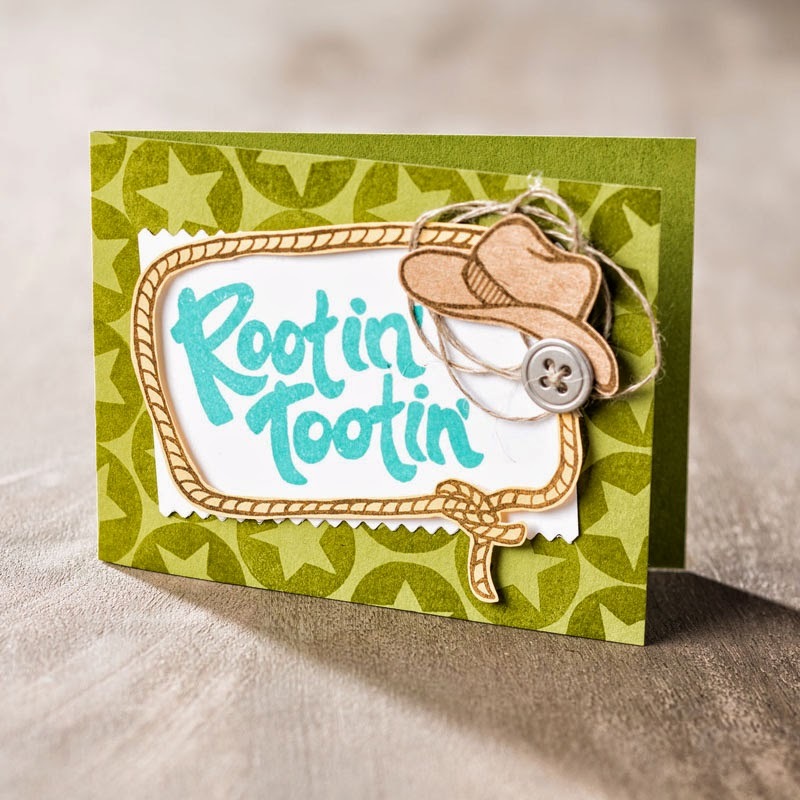 For this card, I used paper from a retired DSP Stack, and paired it with Coastal Cabana Baker's Twine. I liked the look of the front of the card, and I felt like it would look better without a greeting. So I stamped the greeting inside instead. If you needed a card for a different occasion, you could just use a different greeting. You could also sub in any DSP and twine or ribbon. Super simple, yet pretty! Have you tried Paper Pumpkin yet? If not, you should! I finally subscribed because of this great deal, and I'm so glad that I did! This month's kit was AMAZING! This month's kit makes 4 large cards and 4 small gift card-size cards, along with 4 large envelopes and 4 small envelopes. There are also extra supplies to make extra projects! I didn't quite put everything together, but this picture gives you a pretty good idea of what is in the kit. Aren't the cards gorgeous?! Here is a close-up view of one of the smaller cards. The kit comes with 4 different greetings that stamp inside the banners, and a little polka dot stamp. Did I mention there are extra supplies? Extra banners, as well as one extra of each of the large white window greetings (Smile, Thank You, Congrats and Hello), just to name a few. This kit was super easy to put together, although it did take me longer than 30 minutes, which is what it's 'supposed' to take. I might just be slow or meticulous, but it didn't really bother me that it took a little longer. For one week only, now through August 28, Stampin' Up! has a short and sweet deal for you! Join for $99 and get $150 worth of product in your starter kit! Normally, you pay $99 and get only $125 worth of product, so if you've been thinking about joining, now is the time! I'd love to have you as a part of my team! When you join Stampin' Up! 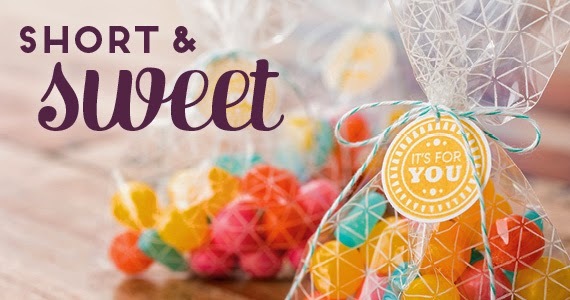 with me, I will provide you with a welcome packet and support as you start your new business. The best part about our starter kit - you get to pick whatever products you want! When you join during this short and sweet promotion, you can even get in on the Holiday Catalog preorder! Visit my demonstrator website to sign up (just click the Join the Fun button at the top of the page). Please contact me if you have questions; I'd be happy to help you! I'll leave you with a non-Christmas card, as promised. I whipped up a bunch of thank yous for my son's birthday gifts yesterday. I followed the theme of his invitations and birthday card, so this looks pretty similar to those. Enjoy! Some of you may remember a photopolymer set that was released last year and sold out very quickly, Endless Wishes. I have some happy news for you today - it is returning in this year's Holiday Catalog! I didn't get this set the first time around, but I made sure to add it to my pre-order list this year. It has so many words and phrases in a beautiful font. Your options for the perfect Christmas phrase are endless! Not to mention the pretty snowflakes that are a great accent to any phrase you choose. 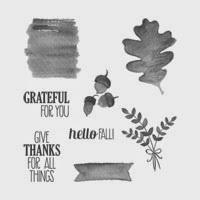 Here is just one sample of what you can do with this gorgeous stamp set. I chose my color scheme based on a suite of products in the Holiday Catalog. These are not traditional holiday colors, but they are so pretty together! Wrapped around the bottom of my tag are 3 of the 5 washi tape patterns that you can get in this product suite. That's right - a set of 5! I was really excited to see that because washi tape is an easy addition to any card. Enjoy, and I'll be back tomorrow with a non-Christmas card! Ok, so I know I promised not to share Christmas cards with you every day, but I've been working on samples for my Christmas Card event, so today you get to see another one! This card features a new photopolymer set called Festival of Trees, and a retired item from last year's Holiday Catalog, the Expressions Thinlits. (The last time I checked, the Expressions Thinlits are on the Clearance Rack!) 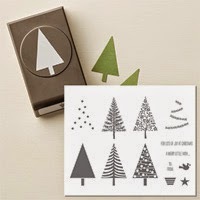 There are quite a few photopolymer sets in the new Holiday Catalog, which I love, because they are so easy to stamp with! This particular set also has a coordinating punch, which is great! The stars are punched out using a retired star punch, but you could easily use the new star punch that is part of the Itty Bitty Accents Punch Pack. Yeah, my husband looked at me like I was crazy when I told him this was our Christmas card this year. In the back of my mind, I know it's a little crazy. But I just love it so much, and it really captures the specialness (yes, I made that word up) of the season. So here's to working on Christmas cards for the next 4 months! My baby boy is one today, and while it is so neat to see him learning and doing new things all the time, I am so, so sad that the baby phase is over! With today being his birthday, I thought it was only appropriate to show you the birthday card I made for him. I stuck to the color scheme/theme of his party invitations, and I thought the result was pretty cute! I used the Project Life framelits to cut out the Whisper White for the greeting, and then fussy cut the other colors for the border. Today's card is another that I whipped up quickly last weekend for one of many August birthdays in our family. That darned Birthday Wishes stamp still didn't want to come out perfectly for me. Time to put it away for awhile and move on to something else! For now, don't forget to check out the Big Shot sale. It's a great time to buy one if you don't already own it! And make sure to sign up for Paper Pumpkin, which is 1/2 off right now. August's box is on its way, and I can't wait to see what's inside! I'll be sharing that next week, hopefully! Weekly Deals ~ August 12-18 & A New Photopolymer Set! To take advantage of any of this week's deals, or to purchase this cute new set, click here to shop in my online store. When I need a quick card, one of my favorite things to use is Designer Series Paper. It makes a card look a little more 'fancy' without a lot of effort. I love the DSP Stacks for this, because the sheets are already cut down, and you get a larger variety for a smaller price! I went back to the Moonlight Stack for this card. I just love the color combinations too, especially since they include one of my new favorite colors, Blackberry Bliss! You may not recognize the stamp I used. It's an oldie but goodie from 2004 (or so the stamp says) that I bought long ago when I first started using Stampin' Up! products. I love this retired set, and still pull it out on occasion. This greeting worked out perfectly for a birthday card! 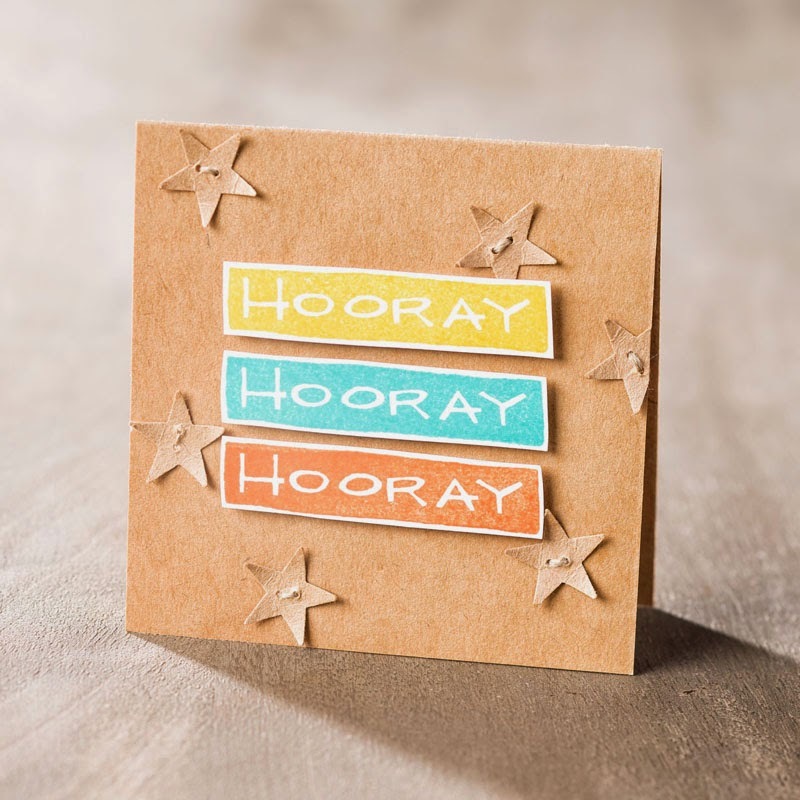 You might see something new on this card... those pretty stars are a new embossing folder in the Holiday Catalog! It was at the top of my list when I saw it, because I love stars and I knew it would be useful for more than just Christmas! Next on my list is the Confetti Stars Punch - once you see it, you'll want it too! I've got a few more birthday cards to make this weekend, so watch for those to pop up here next week. Have a great weekend! I saw a post on Facebook yesterday that Christmas is only 149 days away! Now, I promise not to post only Christmas cards and projects until then, but bear with me for today. I received my box of preorder items from the Holiday Catalog yesterday, and of course I had to play! There are so many things I love in this catalog, and I'm sure a lot of it has to do with my love for fall and Christmas. I will be holding a Christmas Card event in September, and I've had sketches drawn up of the cards I will be offering for several weeks now. This one didn't take long to put together, and for the most part, it uses items from the Annual Catalog. You get one little preview today, and that is the Real Red ribbon you see on the card. Beautiful! I will be sharing more Christmas items in the weeks and months to come, but I promise to include other things as well. I hope you enjoy this little taste of Christmas, a few months early! Big Shot & Bundles Sale!